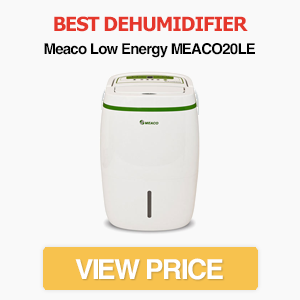 Meaco DD8L Zambezi Dehumidifier Review - Is It Worth Buying? 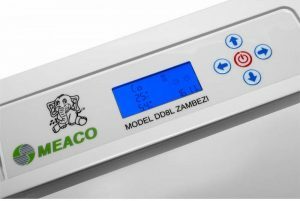 The Meaco DD8L Zambezi (not to be confused with the standard DD8L or DD8L Junior) is probably Meaco’s best desiccant dehumidifier. With a range of features – including 6 “World Firsts” for a desiccant dehumidifier – the Zambezi certainly looks like an impressive model. How does it perform when it comes to reducing humidity though? And how does it compare with other desiccant dehumidifiers? Let’s find out. 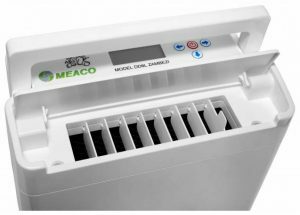 The Meaco DD8L Zambezi is an excellent desiccant dehumidifier that can do a great job of drying out almost any environment. It also comes with a range of features not usually found on this type of dehumidifier, including a daily timer, digital display and ioniser. In terms of appearance, the DD8L Zambezi has a bland and unobtrusive white colour scheme – which is usually what people want from a dehumidifier. It’s not the most modern-looking on the market, which is surprising considering the range of advanced features, but it doesn’t look bad either. It’s also larger than the Meaco DD8L and DD8L Junior. With dimensions of 35.8 x 54.8 x 20cm (WxHxD) it’s slightly wider than these models, but most significantly is nearly 5cm taller. This is unlikely to cause problems, but makes the Zambezi appear a little bulkier. Desiccant dehumidifiers traditionally don’t have a digital control panel – but this isn’t the case with the Zambezi. It’s the first desiccant to come with a digital display, allowing you to view the current humidity and set various functions (more on this later). Air is also passed over an anti-bacterial filter. This, along with the ioniser, helps to keep your home’s air clean and fresh. It’s a lifelong filter so you won’t need to replace it unless it’s damaged. If you look at the control panel of the Zambezi, you’ll see a small image of an elephant. This is a depiction of Zambezi the rescue elephant, who the dehumidifier was named after. Zambezi was rescued from poachers and is currently living in Zambia. Meaco also donates £2 to the David Shepherd Wildlife Foundation – the organisation currently looking after Zambezi – for every one they sell. While this doesn’t make any difference to the performance, it’s a nice gesture. The water tank can hold a maximum of three litres before it needs to be emptied. This is 50% bigger than the original DD8L, but smaller than models such as the EcoAir DC202 and Ebac 2650e. Even so, you won’t need to be continuously emptying the machine. 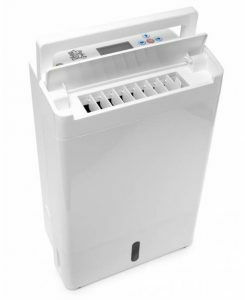 As you would expect from a modern dehumidifier, the Zambezi automatically cuts out when it’s full. There’s also an “anti-drip” spout, so when you remove the tank no water escapes. There’s also a continuous drainage option and a hose is supplied with the machine. 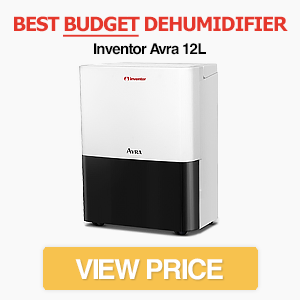 With a weight of just 7.8kg, it’s one of the lightest dehumidifiers on the market. It also comes with a pop out carry handle, so it’s easy to carry around the house. A downside is that it doesn’t have wheels. The lightweight design makes this less of an issue though. You can add as many “World Firsts” and high-tech features as you want to a dehumidifier, but if it’s terrible at extracting water it’s worthless. Fortunately, the DD8L Zambezi has fantastic water extraction capabilities. While the 8 litres/day extraction rate (at 20 degrees Celsius and 60% relative humidity) might seem low compared to refrigerant models, its ability to extract at lower temperatures means it’s much better suited to the conditions found in garages, boats and other cooler locations. That doesn’t mean it’s unsuitable for houses though. The Zambezi is able to extract plenty of water at a range of temperatures, which makes it an excellent all-rounder. So whether you want to use it in your lounge or basement, it won’t let you down. Additionally, with its humidistat able to target relative humidity with 5% steps (between 40-70%), it’s great for drying out excessive moisture in your house without wasting energy. The humidistat isn’t completely accurate, but does a decent job of reducing humidity to the right ballpark. An interesting extra feature is Meaco’s “20+ Control.” If you don’t set the machine to the correct mode, the humidity could rise despite selecting a lower target. If the humidity gets to more than 20% above your target, the machine will increase its fan speed in an attempt to get it back under control. While this probably isn’t going to happen often in a house, it’s a handy feature for boats or other places where you might not be able to check the dehumidifier for extended periods. There are also three fan speeds (low, high and laundry) along with a rotating louvre. This allows you to reduce energy usage in exchange for a lower extraction rate. While fan speed settings are fairly common for dehumidifiers, this is a useful option to have. Meaco rates the Zambezi as suitable for everything from boats to 5 bedroom houses. This isn’t unreasonable, as it’s a powerful model with excellent performance. With that said, if you’re looking for a dehumidifier for a large house, the Meaco Low Energy is probably a better option – assuming the house is kept at reasonably warm temperatures. The Low Energy is a refrigerant machine, unlike the Zambezi, so it performs best in warm conditions. If your house is usually cool, however, then the Zambezi is a great choice. The Zambezi has three fan speeds, so the noise output depends on which you select. On its lowest setting, it makes a noise of just 41dB, which is low. If you turn up the fan, the noise gets noticeably louder though. The highest fan speed generates 50dB, which is louder than some refrigerant models. While we wouldn’t say it’s loud, it’s certainly not the quietest either. The energy efficiency also depends on the setting you use. At its lowest, the desiccant design of the Zambezi means it consumes just 45W. The highest setting uses 600W, however, which is much higher than equivalent refrigerant models. The range of on/off settings and built-in humidistat help to keep energy costs down though. Something that’s missing from many desiccant dehumidifiers – and some refrigerant models too – is a timer function. Meaco has gone out of its way to correct this, by including a Daily Timer, On Timer and Off Timer. This gives you greater control – which is essential considering the relatively high energy usage of the machine. One of the unique features of the Zambezi is the sterilising ioniser. While plenty of other dehumidifiers have an ioniser, the Zambezi has a much larger ionisation range of up to 10 metres. This, according to Meaco, destroys bacteria, mould and viruses far more effectively than other machines. There’s also a Laundry Mode – with a twist. Unlike regular laundry modes, which set the dehumidifier fan to full and run until you switch it off, the Meaco uses a humidistat to monitor humidity. As clothes dry, it reduces its energy usage to minimise the cost. A slightly gimmicky feature is Meaco’s “Turn Me On” function. If the dehumidifier is switched off but the relative humidity rises to more than 70%, the machine will instruct you to turn it back on. While this is a unique feature and could be potentially useful, it could also be annoying depending how often humidity rises in your home. It’s also useless in environments where the dehumidifier isn’t checked often, which are the places where unchecked humidity is most likely. There are a few other features worth noting. These include anti-mould coating and a child lock. The machine will also automatically restart if you have a power cut with the same settings as before. Despite being the first desiccant dehumidifier to have a digital display, the Zambezi is simple to use. There are five buttons at the top of the device – four arrows and an “on” button. All the settings are displayed on the digital screen, so you can cycle through them using the arrow keys. As we mentioned earlier, you can set the target humidity in 5% intervals from a minimum of 40% up to 70%. There are also settings for the louvre, On/Off timers, daily timer and fan speed. The Meaco DD8L Zambezi is a fantastic model and worthy of its place on our list of the top rated dehumidifiers – but it’s not cheap. 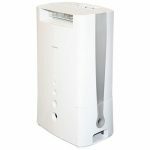 With an RRP of £260, it’s one of the most expensive dehumidifiers on the market. 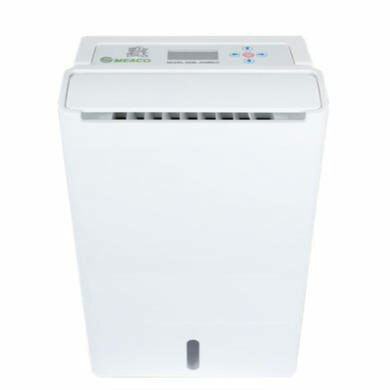 In our opinion, it is if you want a desiccant dehumidifier. It provides excellent water extraction rates in almost any temperature, a range of useful features and is easy to use. The Zambezi is also reliable, so if you need a model that isn’t going to let you down then it’s a great option. 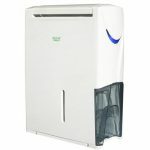 Overall, the Meaco DD8L Zambezi Desiccant Dehumidifier is a fantastic machine. It has a range of genuinely useful features, outstanding water extraction and is highly reliable. These characteristics, combined with the ability to work at lower temperatures than refrigerant models, makes it a great all-rounder. That doesn’t mean the Zambezi is for everyone though. If you only need to dehumidify a warm room, then a refrigerant dehumidifier might be a cheaper choice. If you need versatility or the option of removing moisture from cooler environments, we highly recommend the Zambezi.